Appearance (0-20): There is nothing overly flashy about this stick. It does have a beautiful dark habano wrapper. It is somewhat oily to the touch, and smells great. The band is simple, but it has an elegant look to it. It could be due to the use of blacks and golds. Nothing sets this stick apart from others, but it definitely doesn’t look like a dog. Construction (0-20): Solid cigar here. It feels very well packed with no soft pockets at all. There are very small veins, and it looks well rolled. Upon lighting, the draw was a little bit tight. They really packed the tobacco in here, which lead to it being tough to get some smoke out. I’ve smoked about 6 of these by now, so it’s just how the cigar is. Strong ash, and overall I was pleased. Strength (0-20): I believe this is marketed as Medium, but I would put it into the mild-medium range. There is nothing overpowering here, and it is a very relaxing smoke to enjoy. Flavor (0-20): The flavor was great. It is very creamy from start to finish, giving off notes of nuts and woodiness. The cream will linger on your tongue after you blow out the smoke, and there are hints of spice here and there. While not overly complex, the flavors are very relaxing and enjoyable. 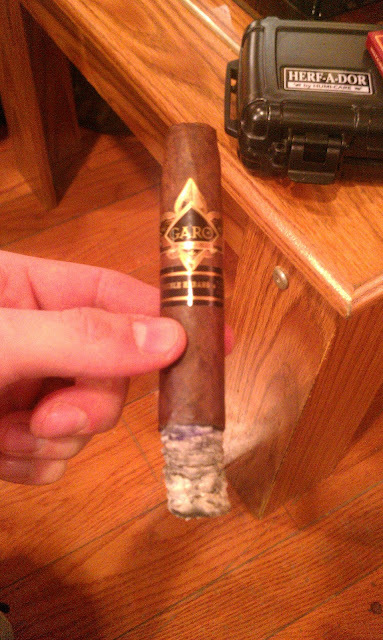 Its one of those cigars that you don’t need to think about, but just sit back and enjoy. Value (0-20): Here is another homerun for the value. A bundle of 20 cigars will cost you $1.50. Are you kidding me? This is one cigar I will buy over and over for a smoke that I just want to relax on. This is also a good 2nd smoke, but I might recommend the small robusto. If you smoke this without knowing the price, you might guess $5 or $6. Additional Notes: Smoked after the Wolfman for a 2nd smoke. Paired with blue Gatorade and smoked at CI. Overall (0-100): While this isn’t a heavy cigar or overly complex, the real selling point is the price point. For $1.50 - $3.00, I could smoke these every day. They are great to offer to others that don’t smoke too often, but they aren’t just mild and taste like paper. If you see these online, I would grab a bundle for yourself. The only other cigar around this price that is comparable is the La Perla line. I agree, these are great for the price. I'm most of the way through a bundle of 20 and haven't had a bad one yet. I don't recall liking it as much the first couple smokes, either they're growing on me or extensive humidor time has improved them. I obtained mine almost two years ago.